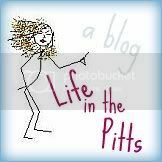 Life in the Pitts: Homeschooled kids are SO WEIRD. Uhhhhhh.... What the HECK was that?!?! Holy cow. I can't help but laugh and agree that I used to think of something similar when I thought of homeschooled kids. Thank goodness I know better now! Ok, Helena, this has reached a whole new level of WEIRD. :) I have to admit, I could only watch about 45 seconds of that - the last 15 of which were only watched due to my stunned paralysis. I can't even understand why a parent would want to be with their kid 24/7. I really can't. I love my kids but HOLY MAN we need time apart. We do. Time apart is good. Even it if means they learn gang signs at lunch. I was like a deer in headlights. Is that for real? OMG, I'm gonna have nightmares about that. Holy weirdness!